Sleep – it’s what babies do best isn’t it? After all we talk about “sleeping like a baby” to describe a good night’s sleep. But how much sleep do babies need? And how can you get them to sleep through the night? All babies are different and the amount of sleep they need will vary. Newborn babies generally spend more time asleep than awake. Under the age of three months, babies can sleep for anything up to 18 hours a day, although unfortunately their sleep pattern is unlikely to fit in with yours and they rarely sleep for longer than four or five hours at a time. Try to bear in mind that this phase isn’t forever. It lasts for a relatively short time and things will usually get better. Coping with night feeds and trying to keep going during the day while struggling with tiredness on top of recovering from giving birth can leave you feeling emotionally drained and physically worn out. It’s important to recognise your own needs. Make the most of your baby’s daytime nap to catch up on your own sleep. The good news is that as babies get older, they need fewer night feeds and usually sleep for longer periods. All babies have different sleep patterns and parents and babies are usually happiest if you follow your baby’s sleep cues to form a gentle routine rather than imposing a routine on them. If you have a partner, share the burden. If you are breastfeeding, this may mean asking your partner to do the early morning changing and dressing so that you can go back to sleep. How many naps do babies need? In the first couple of months, babies may need a long nap in the morning and a couple of shorter ones in the afternoon. These naps will generally get shorter as your baby grows and by the time they are six months old many babies will be sleeping for up to 12 hours at a time at night time, however they may still be waking several times during that period for food or comfort. Don’t worry about keeping the house silent while your baby sleeps during the day. It is good for them to get used to sleeping with a certain amount of noise and will help to teach them the difference between day and night. Daytime is signalled by lots of interaction with you, toys and play, while night-time is signalled by quiet and dimming of lights. Be guided by your baby and watch out for signs that they are tired (crying, rubbing eyes or showing faint dark circles under the eyes). Use these signs to gauge when to put your baby down for a nap. Things will get easier once your baby settles into their own routine and you get used to their rhythms. If your baby doesn’t conform to what the baby books say about sleep patterns – don’t despair. Don’t assume that it is your fault or you are doing something wrong. 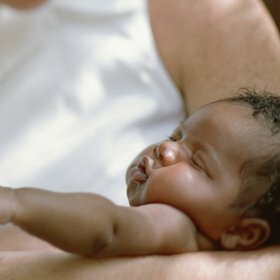 Every baby is unique and has his or her individual personality and rhythms. Some babies naturally need less sleep than others. However, a baby who is continually sleepy and doesn’t wake up for feeds could be ill. If you are worried about your baby’s sleep pattern for any reason, or feel you can’t cope, don’t be embarrassed to ask for help from your Health Visitor or GP. It’s important to establish a bedroom routine e.g bath, change into night clothes, feed, cuddle, bed. Babies are creatures of habit and having a routine can reassure them and help them to settle. If your newborn is very unsettled, you could try swaddling them – this can help babies to feel safe and secure. During the night keep things as calm as possible, talk quietly and avoid over stimulating your baby. By contrast, during daytime feeds, chat and sing to your baby and keep the environment light and bright. Whilst it can be tempting to rock your baby to sleep, be prepared that this may be building up problems for the future. If your baby is used to you always being in the room when they fall asleep, they may find it difficult to fall back to sleep when they wake up during the night. If you can, try to put your baby to bed whilst they are still awake so that they get used to falling asleep by themselves. If your baby won’t settle without you in the room, try gradually withdrawing from the room for a period of a few days, each day moving a little closer to the door until eventually you are outside the room. In the early weeks, your baby will need frequent feeds and will probably wake regularly at night. You can encourage your baby to go back to sleep more quickly by avoiding over stimulating them during night feeds. Keep lights to a minimum and don’t change your baby unless really necessary. If your older baby wakes up continually during the night avoid picking them up immediately. Leave it a few minutes to see if they go back to sleep. It is recommended that you put your baby down awake if possible. This is to encourage your baby to find ways to get himself to sleep rather than being dependant on you. Then say your "goodnight" and turn out the light. This will help him get used to sleep in the dark. Some parents like to use a night light so if the baby does wake, he is not too stimulated by having to turn on the main light. Research has shown that around 22% of nine-month-olds have problems going to sleep and 42% regularly wake up more than once during the night. Even babies with previously set sleeping patterns can start waking up. Once this happens, it is important to try to identify the cause before it becomes a habit. After the age of six months, some babies can manage without a night time feed; however they may continue to wake up out of habit. If your baby seems obviously hungry then feed them but if you are confident they have eaten enough during the day and they are gaining weight, you can help your baby to outgrow this habit by leaving it a few minutes before you pick them up as they may fall asleep again naturally. You could also try offering a drink of cooled boiled water rather than the breast or formula. Once they realise that only water is on offer at night, they may decide that it’s not worth waking up for. However, it is worth remembering that all babies are different and some babies still wake for a feed in the night until well after 12 months. Dark curtains can help too, especially in the summer months when early waking due to light mornings can be a problem. If you would like to share your experiences, please visit the Pregnancy and Baby section of our forum.